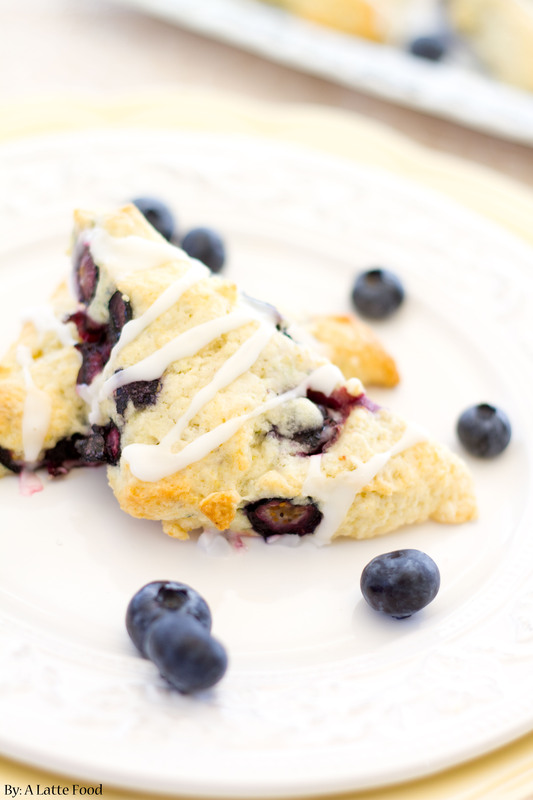 These easy homemade Lemon Blueberry Scones are sweet, buttery, and topped with a tangy and sweet lemon glaze! 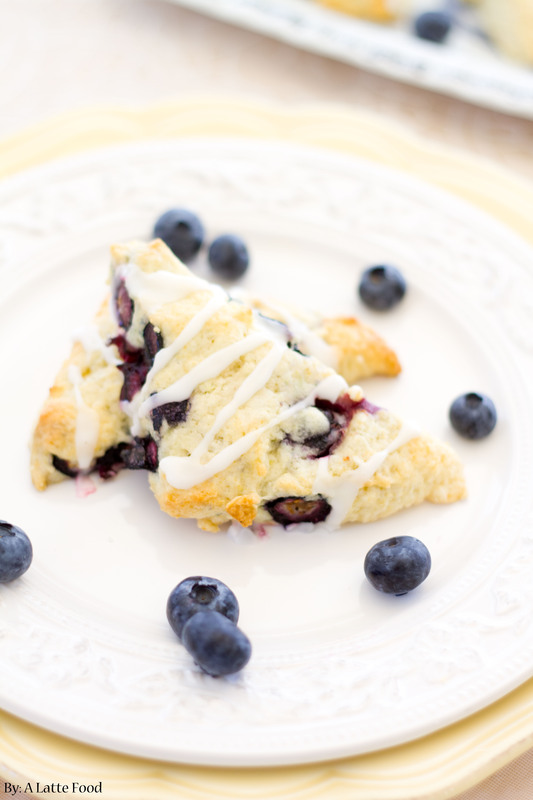 Homemade scones are perfect for breakfast, brunch, or even an afternoon tea snack! In my life, I have found that people don’t really like scones. Personally, I find that sad, because I have a real thing for them. My favorites? Peach Pie Scones, Strawberry Lemon Scones, and Apple Pie Scones. The usual complaint? They’re too dry. I get that. I really get that. Scones can be very dry. It’s a legitimate complaint, because, let’s face it, a lot of scone recipes are dry. It’s probably because you’re supposed to top them with cream or jam or something like that, but, that’s a lot of effort. Plus, I prefer a flaky, tender scone full of flavor that doesn’t have me gasping for water. So, don’t worry, guys. These scones are not dry at all. Not even a little bit. I promise you this, these scones are good and not dry at all. 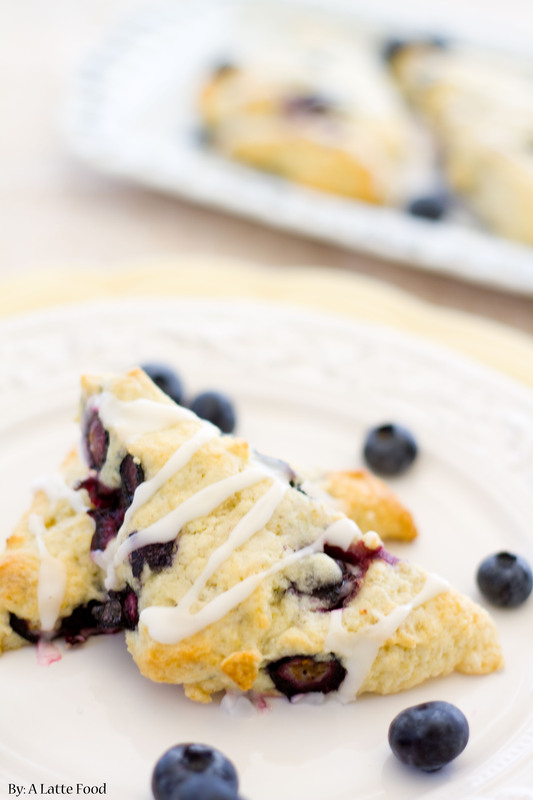 Plus, they’re filled with sweet blueberries and tangy lemon zest and glaze. Now, as some of you might recognize, I really like the lemon blueberry combo, as seen here in my lemon blueberry cheesecake bars. There’s just something about the blueberry flavor mixed with the bright lemon flavor that create this out of the world combination. Plus, it’s pretty much like summer in a scone. And, I really like scones. They might be one of my favorite snacks. Okay, so I really like anything sweet. My sweet tooth runs deep. Since my New York trip, I’ve been attempting to re-create everything I ate and share it with you guys. Now, I ate a lot of great things in New York from a lot of great places. I wasn’t planning on including the scone I ate from Starbucks (in the airport) in this post, but after making these for a friend’s baby shower (or baby sprinkle since it’s her second child 🙂 ), I decided why not photograph these delicious babies and post them for you? It’s simply ironic that I happened to eat one in NYC. I guess my love for scones runs deep. 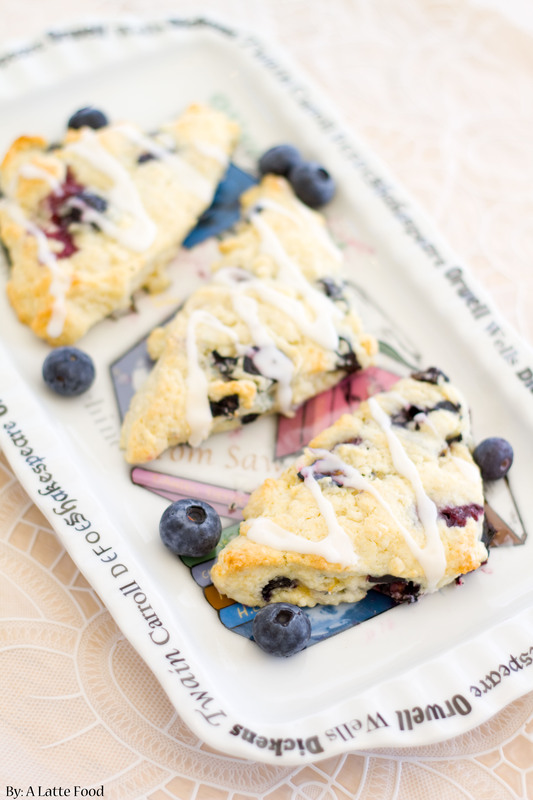 I’ve made these time and again, and the scone foundation is my go-to scone batter because it’s easy to work with and never dry. You start with flour, sugar, salt, zest, baking powder, and cold butter and combine it until it resembles coarse crumbs, much like pie dough. Next, you add an egg and heavy cream. Lastly, you add in blueberries, and the dough is done. Pat the dough into a circle, with the dough about 1/2 inch thick, and cut the dough into 8 triangles. Bake at 400 for 12-14 minutes or until golden brown. Mix lemon juice and powdered sugar for the glaze, pour over the scones, and eat ’til your heart’s content. In a bowl, mix flour, sugar, salt, zest, and baking powder together. Cut in cold butter with a pastry cutter and mix the dough until the butter is about the size of peas and the dough resembles coarse crumbs. Mix heavy cream and egg together, and slowly drizzle into the scone batter while stirring gently. Stir just until combined. Lastly, add in the blueberries and fold in gently. On a floured surface, turn out the dough and pat into a 1-inch thick circle. Cut the dough into eighths, place on a greased baking sheet, brush with heavy cream, and bake for 16-18 minutes, or until golden brown. While the scones are cooling, mix together lemon juice, powdered sugar, and zest. Once combined, drizzle the glaze over the scones. Dry scones? Yes I can see why that would turn you off them! It would be like eating a mouthful of sawdust. Though I do find that excessive amounts of cream and jam can disguise a bad scone. These, on the other hand, look absolutely divine and don’t need ANY cream or jam on the side! Thanks! And, haha, I absolutely love jam–so that’s a perfect idea to fixing dry scones! Love it.